Unless your TV diet consists wholly of The Weather Channel (like my parents) or politics (like me), it's rare even to spend a few hours without catching the newest trailer for Duty, Assassin's Creed, or the newest Rockstar joint blasting across the screen for thirty seconds at a time. So with its ever-growing pervasiveness in popular culture, it's likewise interesting to see how gaming is represented in other mainstream entertainment. Gaming is no longer shown as just a nerd hobby or the stereotypical outlet for obsessive, rebellious teenagers. No, gaming is a business. And even more, gaming is a career people can study, major in, and in which they can find success. You may recall the movie Grandma's Boy, a movie which in the industry is both reviled and revered for its so-called glimpse behind the development curtain. Despite its fairly loose (to put it mildly) interpretation of gaming and gaming culture, for many it was their first introduction to gaming portrayed as a career. 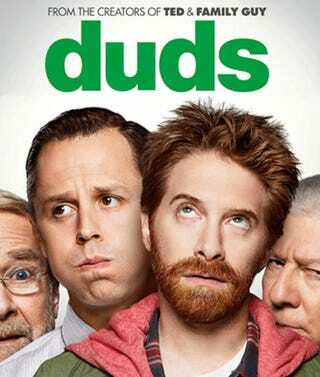 And since Grandma's Boy, we've been And this brings us to the most recent Dads, the new(ish) Fox comedy starring Seth Green and Giovanni Ribisi. Now, I'm not anything close to a professional TV critic, but I've closely followed the controversy preceding Dad's debut. Being a gamer myself, I felt some vested interest in just how my industry would be portrayed some eight years after Grandma's Boy. I'm sorry to say, the accuracy needle has not moved much. First, a primer. If you don't know, Dads is the newest offering in the Seth MacFarlane dynasty, only MacFarlane has traded his traditional animated medium for real people. Actors Seth Green and Giovanni Ribisi play game developers Eli Sachs and Warner Whittemore, founders of the wildly successful gaming studio Ghost Child Games. Along with their compatriot Veronica (played by Brenda Snow), Eli and Warner endure the sometimes obnoxious, sometimes controversial antics of their fathers, who regularly insist on inserting themselves into company business. The show itself has faced intense criticism for its very loose handling of racial comedy and gender politics. (If you're interested in reading more on this front — and if you're reading this, you probably are — there are numerous resources sprinkled across the web. Just google "Dads" and "controversy.") But rather than focus on the so-called humor, I'd like to take a look at the authenticity of the game development angle which show writers Alec Sulkin and Wellesley Wild chose to explore with their title characters. First a quick bit about me — I've been working in the game industry for ten years now. I did test work for a couple of years and am now one of a few senior managers of a small test organization with a major publisher. While game development in general is as ever-changing a philosophy as technology itself, and I, of course, can't speak to everyone's practices and processes, I'm pretty solidly confident and competent to provide analysis as to the general processes and practices. 1. For one, there is semblance of a role and management structure. While Eli and Warner's titles are fairly ambiguous (more about this later), Veronica appears to have hiring authority, making her at least some senior level manager. 2. The atmosphere is mostly authentic. The culture seems casual —desks are decked out in toys and other nerdery (game devs are just big kids, after all), and dress is relaxed (though sometimes a bit too relaxed.) But in general, the set is, eh, fairly convincing as perhaps one corner of a small game studio, at least more so than Grandma's Boy. (Though why are there so many pencils?) Also, we'll just assume everyone in scene is not an engineer. More and more we're seeing gaming portrayed as a viable career in other media, and since Dads means to represent the business of game development, albeit a loose interpretation, it seems a reasonable point of review and criticism. After all, we in the industry haven't done the greatest job of sharing the instructions (if such instructions even exist). 1. There are many roles and too few people filling them. As the main characters from Dads founded their own video game company — Ghost Child Games, known for such runaway hits as Kill Hitler and "unnamed boxing title" — it stands to reason that a good portion of the show takes place in the thick of it at the game studio. When episode 1 begins, we open on Eli helping to coach a voice actor at an onsite recording studio when his partner Warner enters to complain about his dad situation. Later on, we see Eli and Warner negotiating with some foreign investors on their newest title Kill Hitler 2. Veronica, who at first seems to be in some sort of producer role, promotes herself to VP of Game Development by the end of the first episode and is taking customer service calls and refilling water coolers by ep 3. She also hires Warner's dad as a general admin. In episode 2, we learn that Eli is the design brains behind Ghost Child's immensely successful games. So there we have in just these first few episodes we have the following roles: Producer, Designer, Vice President of Game Dev, Business Manager, Marketer, General Administrator, General Manager, Customer Service Representative, Facilities Manager, and Audio Engineer. With the exception of coders and a dedicated test group, it's actually a fairly robust and diverse set of players. The problem is that all of these roles are held by just three people. Now you may be saying, "It's a sitcom. It's supposed to be unrealistic." Well, you're not wrong. Half the purpose of TV is to provide an outlet for fantasy and expression, and suspension of disbelief is often prerequisite to the former. But even the most outlandish story concept needs to obey some basic ground rules in order for the audience to "buy" the gimmick. And the problem with Dads is that its exploration into game development, even just how normal business in general works, is so lazy and ill-researched that it's hard, at least for a game developer like myself, to take it even remotely seriously. 2. Games are developed by magic. Admittedly game developers have not done a great job of revealing or promoting the actual process of creating a game product even within the confines of our industry, and so oftentimes roles and responsibilities differ greatly across the spectrum of the industry. This one abstraction is just a verifiable and sometimes unfortunate truth for software dev. But let's chat a bit about how a game idea is born, and be forewarned — for the purposes of crafting an actual picture of what true game development is like and contrasting it against Dads, I may jump around a bit between episodes. There are a number of reasons why a company may choose a specific concept for a game. Perhaps they are seeking to develop a new IP or licensed content. Perhaps they are iterating on an exhausted or over-saturated genre to fill a gap in the market. Or perhaps they are just building the sequel to Gears of Duty 20. There are a million possibilities as to why a game idea is born, but one thing is certain — in the real world it takes the work of designers (sometimes dozens of them) to expand a concept into something that can be engineered. It's not just a simple matter of popping off a letter to Valve with an amazing game idea and waiting by the phone in hopes they finally recognize your genius. But there is this misperception that game designers do just that — that their days are chock-full of blasting out conceptual concoctions for the next quad-A in 140-character rants, and it's up to all the rest of those creativity-deficient hacks in the rest of the studio to figure out how to capture perfection in a box. We see this very novelty in Episode 2 of Dads, which is almost wholly devoted to the comical task of coaxing Eli into his game concept mode with pot brownies. The elaborate and grueling process of proposing and iterating on a game concept which sometimes takes weeks, oftentimes months, is condensed to a single sentenced stream of consciousness blurted out near episode's end. Now, sure, this is all comedy, and most people would realize that designers don't really sit around consuming pot, hoping for the next great Metal Gear to be born between the pink elephant hallucinations (if only it were so easy). But just the very idea that any one person in a company could be tasked with spouting out game ideas of no discernible actionable detail, just abstract, high-level case diarrhetic verbiage needing no further iteration, uncontested, untrialed, and unscoped is ludicrous at best. Yet as instantly as Eli presents a "tenable" idea, Veronica, the new VP of Game Development (whatever this means in this context) unilaterally greenlights and pushes the concept into production. How anyone will actually develop this game is anyone's guess. You see, Game Designers are not magical sages whose word is law with regards to a game idea. In many models, they are often beholden not only to an executive team and product marketing, but also to a hard-line producer, whose role it is to settle the game's budget, scope, and schedule. While none of these are critical path in comedic writing, even the most lay person interested in gaming would probably expect more steps between: 1. Barf out game idea. 2. ??? 3. Game enters final production. But what are those critical steps? Well for one, actually designing the game. All Eli (seemingly) did was confirm the overarching concept of the game. Expecting anyone to begin development on this would be tantamount to Miyamoto proposing a game where a kid in a green tunic travels from dungeon to dungeon in the effort kill an evil sorcerer and save his not-quite girlfriend and being shocked when the next Zelda arrives as a first-person cooperative shooter. (And I do apologize profusely for comparing MacFarlane's weak facsimile of game development to one of the greatest designers to ever breath.) But I digress. See, the problem with not actually writing Game Design Documentation (or GDDs) is that the only person who can really read your mind is you. GDDs take an abstract game concept and break it down into actual quantifiable needs. Most games no matter how small have dozens of pages of GDDs — an action/adventure title on console/PC will very easily number in the hundreds, the purpose of which are to bridge that gap of understanding between designer's brain and everyone else's. So as you can guess, the goal is often to make these design documents exhaustive so as to eschew the likelihood of misunderstanding. And even then, it's often necessary for GDDs to be living documents that can be updated to reflect altered or additional functionality, as the designer rarely considers of every situation an end user can stumble his or her way into. But it looks like you didn't want to write any design documentation. Mario Galaxy is now in development as a real-time puzzle RPG/shmup, and the GM of Nintendo is furious. Poor you. But in all seriousness, ever play *Telephone* as a kid? You know, that game where one person whispers a phrase or sentence to someone else, and that kid whispers to the next person, and so on and son on. But when the last person in the chain is asked to recount what he heard, his sentence is so indistinguishable from the first person's that only hilarity can ensue. Well, this is exactly what you want to avoid in game development + miscommunicated concept and mistaken execution = wasted time = wasted money. Though perhaps this very concept is the joke —Just blurt out an idea, toss it into production, and BOOM, instant comedy. 3. The company is more successful than Facebook. One of the more curious concepts with Dads is their company's solvency. Even assuming we're only seeing a small corner of the building in the studio set, Ghost Child Games still looks to be your average VG startup — flat structure, open discussion between executives and rank-and-file, etc. A lot of startups over in Silicon Valley have backers who are privately funding their ventures - mostly mobile and social. Despite the scene with Warner playing the unnamed boxing title in front of his TV in episode 1, I'm going to assume GCG releases primarily on PC. This is because (1) no first party on planet earth is going to allow "Kill Hitler" to be sold on their platform, and (2) no one cares about Mac. In general, though, sure — let's say this setup is mildly plausible. The curious part comes in the cafe scene of Episode 1 when Warner's dad makes reference to Ghost Child Game's success by referencing its stock price. Stock price? Is Ghost Child Games publicly traded? Well, that's interesting and... fairly impressive. But wait, if GCG is publicly traded, why were they courting foreign investors again in the same episode? (This was literally the pilot's whole premise.) Well, probably just an oversight I'm sure. And we get it — Ghost Child Games is successful. It's insanely successful — this is just part of the show's fantasy. But just how does their success measure up exactly? Well, for comparison and trivia, both Twitter and Facebook only just went public in the last two years. That's pretty damned successful (...and kinda farcical). So there you have it. Three things Dads, for all its obliviousness and controversy, gets right about game development and three things Dads get very, very wrong. This is by no means a comprehensive list for either (though I'd bet the "right" list is little closer). Fox recently announced that Dads would be going on hiatus sometime in early 2014, and it's likely its inaugural season will end incomplete. Aside from the dubious distinction of being dubbed the worst show of the Fall TV season by several outlets, there are indeed many, many reasons not to bother with the show. Its sloppy and woefully inept depiction of game development is just one of them.